Leftover BBQ Ribs Pizza [recipe] – Cin Cin, Let's Eat! We were invited to a BBQ at my cousins’ place this past Sunday. On the way up from Los Angeles, they picked up enough steaks from Harris Ranch to feed a small army, plus six full racks of ribs. And yes, we also ingested lots of delicious side dishes such as garlic bread, potato salad, guacamole, bruschetta, and etc. We ate for hours and there were still tons of leftovers, we took home almost a full rack of ribs! Yesterday both Joe and I worked late. It was just one of those nights when I didn’t really care to reach for a pot or a skillet to make something to eat. Luckily we still had a bag of whole wheat pizza dough from Trader Joe’s. Hmm, a light bulb went off in my head…leftover ribs on pizza? Interesting! But as great as that sounded, I don’t think eating pizza with meat as its only topping can be very good for the health. I rummaged through the fridge drawers for anything else that could compliment to this creation. Here it is! Follow your favorite brand or pizza dough recipe’s directions. Roll or knead the dough to fit your pizza pan. I do recommend blind-baking the pizza dough for at least 5 minutes first to ensure it baking all the way through at the end. 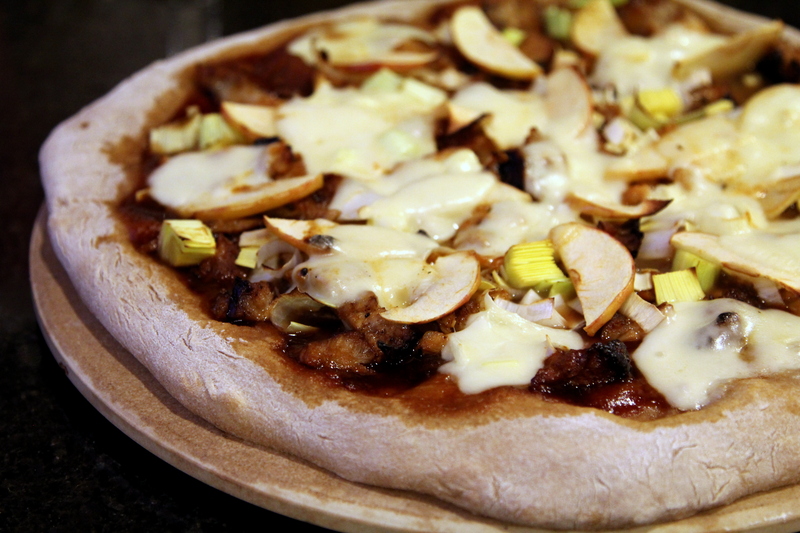 The order I placed the toppings: First, a small ladle of bbq sauce, spread evenly on dough – then the slices of mozzarella, and meat from the pork ribs (cut in smaller chunks) – sprinkle on the chopped leeks and place the thinly sliced apples. More cheese on top if you like! Bake according to your pizza dough recipe’s instructions, until crust is golden brown. Overall, I was pretty happy with the result. The barbecue sauce slightly over-powered the taste of the apples, but I could still taste the sweetness of them. The leeks were a pretty great addition, too. Maybe some chives next time to bring out their garlicky and onion-y qualities. Such a great spread and a great way to use the leftovers. Yum! Never thought of leeks on pizza. This looks so fresh! Can you mail me a slice? just saw this post. love how u made a yuM new meal from the bbQ leftovers!! !